Hi folks. I’m feeling a bit under the weather today, what with a bad back and a headache, so I’m just going to write a bit of a filler post about a book I have found very interesting and that I think you would thoroughly enjoy and benefit from reading also. 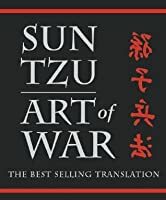 I am, of course, talking about Sun Tzu’s the Art of War. The Art of War is ancient Chinese military strategy manual dating back to the 5th century BC. It has been translated into many languages including English and makes essential reading for military, business and government leaders alike. The strategies described can be transferred to all works of life and the manual is kind of a “how to be successful” manual in disguise. It is also really interesting to get an insight into the thought process of somebody from that time in history. It’s amazing to think that the influential teachings of somebody who lived over two thousand five hundred years ago can have so much influence on how people act and think in their daily lives in the modern world. The manual is broken down into 13 chapters, all of which cover a different aspect of warfare strategy. I would thoroughly encourage you to give it a read. Are there any books you would recommend reading? I’m always looking for a good book to read so be sure to let me know if you have any favourites that you think would fit the bill. Just drop me a line at the usual address if so. While we are the topic of reading, do you guys prefer to read a good old paperback or have you made the move to a kindle reader or tablet additions? I personally love reading on my iPad. But that’s just me. Anyhow, that’s it for now folks. Speak soon.